On Android, home screen widgets are bite-sized versions of standalone apps that provide easy access to commonly used operations. As Apple does not allow similar functionality on its own iOS operating system, building the feature into Apple Music for Android proves the company isn't shying away from exploiting that platform's strengths. As noted by The Verge, Apple's new widget includes a thumbnail of the current album playing and boasts controls for pausing, skipping and revisiting the last played track. A familiar heart icon is also included for favoriting songs, which subsequently informs Apple's For You personalized playlists. In addition to the new widget view, Apple Music for Android now accepts gift cards to renew memberships using iTunes credit, while a Radio tab upgrade lets users see what song is playing on Beats 1 prior to tuning in. The update also includes user interface tweaks for the Now Playing section and expanded Apple Music catalog charts. 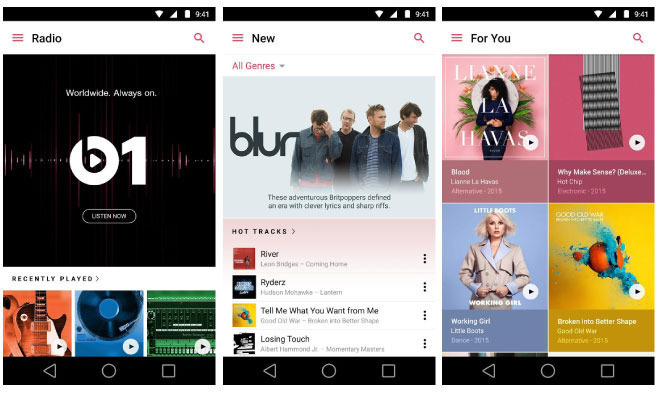 Apple Music launched on Android last November as a beta service, offering users access to a vast music catalog powered by iTunes, Beats 1 radio streaming, the Connect social network and more. Apple Music version 0.9.7 is a free update from the Google Play app store.